The Met Police have confirmed the six Greenpeace protesters arrested yesterday on suspicion of aggravated trespass after climbing The Shard in central London have been bailed. Greenpeace had earlier tweeted a photo of the six outside a London police station. Six Greenpeace protesters who scaled Britain's tallest building remain in police custody this morning after being arrested last night on suspicion of aggravated tresspass. They were driven away by police in an unmarked white van to the sound of cheers from supporters gathered at the foot of the landmark. 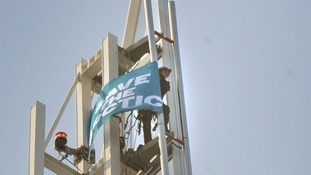 Six women have been arrested after climbing the outside of The Shard building in London to campaign against Arctic drilling. This photo shows Wiola - the youngest of the six climbers - at the top of The Shard in London. 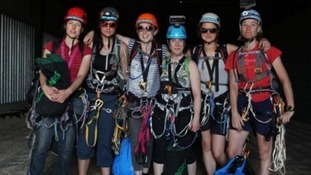 Six female protestors that climbed the Shard today have been arrested. They have been arrested on suspicion of aggravated trespass. Police were called at 04.20hrs to reports of a small group of protesters attempting to scale The Shard, in SE1. It is believed the group first climbed on to the roof of London Bridge Station before accessing the outside of The Shard. All 6 #iceclimb climbers have left the building in a police van. All are safe & sound (but v tired) 310m:15hrs - #Epic human achievement. A police officer can be seen in the live video feed from a camera worn by one of the climbers at the top of The Shard. It is not clear whether any of the protesters have been arrested. Greenpeace reports that its six protest climbers have reached the top of The Shard in London, although live TV footage shows only one of them at the pinnacle. THEY'VE DONE IT!!! 6 #iceclimb climbers at the top of Europe's tallest builidng, waving a flag for humanity, to save the Arctic. The six women who are scaling The Shard building in London are just 18 metres from the top, according to Greenpeace press officer Ben Stewart. One climber has been nominated to "free climb" the final ascent, meaning she will use no aids such as ropes. The #iceclimb women are 18m from the top. they've chosen Wiola, 23, from Poland to make an attempt on the summit. She's going for it. Now. Wiola is the youngest #iceclimb woman. She's free-climbing the final 18m, a third of a kilometre in the sky, right now. Yes, free-climbing.